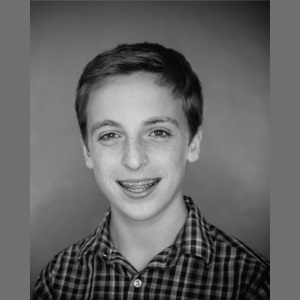 Jacob Cramer, at age 16, is the founder and executive director of Love For The Elderly, a nonprofit organization dedicated to ensuring that our elders receive the utmost care and compassion in their final and most precious stage of life. A strong advocate for social reform, Jacob has given talks and speeches throughout the globe in his pursuit of inspiring others to break down age-related barriers. Although he is just a high school student, his maturity and compassion proves that he is just the right person to generate positive change. His age shows that anyone can make their mark on the world and strive to inspire others to help people, creating a ripple-type effect. He resides in Cleveland (Ohio) with his loving family. Summary: Jacob’s answer to the five questions! Listen to the full conversation on the player above; also available on iTunes, Stitcher and Soundcloud. I think the person that has given me the greatest amount of hope for my future is my mom. Regardless of how her day is going or the amount of stress that she’s under which is quite frankly pretty much perpetual, she always manages to stay optimistic and positive with a smile on her face. That’s something that I really always admire. Throughout much of my life and especially my middle school years, I’ve always been a person who’s very hard on himself. I always beat myself up after I do something wrong or something that I don’t think is exactly up to my standards and my standards are very high. That makes it really difficult because I’m a total perfectionist and I always want to give 110% to everything that I do. When I fall short on my personal standards, this can lead to a lot of stress on myself which poses as heavy burden on my shoulders that I carry around all the time. One particular time that I experienced this stress was last year. I felt really overwhelmed by everything in my life and it was tough for me, but I managed to find a lot of inspiration in the people around me which included my friends, my teachers at school, my family and especially the elders that I work with through my organization, Love for the Elderly. This helped me get out of that spot and really destress myself. I founded a nonprofit called Love for the Elderly in 2013 and basically I was inspired to do that because my grandfather passed away. That was very hard for me. It opened my eyes to the reality of isolation and vulnerability of the elderly in that final and most precious state of life. It’s so sad to think that we have such a limited time on this earth and that motivated me to start volunteering at my local nursing home. There, it was a really great experience. I got to connect with so many elders and I go to their rooms and be the one to light up their day. It was such an amazing feeling. It didn’t feel like I had the power to make as much of an impact as I wanted to so I started Love for the Elderly with the simple hope of bringing some love to some seniors. It got a huge response. It started by writing letters in my living room, letters of kindness and love and I would send them to my local nursing home. Over time, it expanded and after I created a website and social media, it totally blew up and today I’ve reached over 51 countries, 6 continents and 15000 seniors. I just started a senior buddy program which is like a pen pal program that students and seniors write letters to each other each month and they develop this pen pal relationship. This just got featured on one of the biggest news networks in the world called Rating Record and I got to watch them Skype each other. It’s inspiring. My main program is my letters of love. That’s where people from across the globe send me anonymous letters, they’re all hand-written and they’re filled with kind words to inspire and brighten the day of a senior and put a smile on their face. That’s a tremendous success. I’m launching a new program this August called Sunshine Box and I am planning on revisiting my old nursing home to distribute those sunshine boxes. Sunshine boxes basically a fun, vibrant, bright yellow boxes that we’re going to be giving to seniors and hopefully it will bring a smile on their face and it will bring some sunshine in their day. We’re putting stuff in the box like yellow sunglasses and smiley face stress balls, yellow notepads and smiley face pens. I’m hoping it will be successful. (1) Do some random acts of kindness. (2) Find opportunities to give back.